Wondering how to make chicken broth? Chicken broth can also be called chicken bone broth or chicken stock and is valued in most cultures as the basis for a good soup. It adds not only flavor but also incredible nourishment. As the name implies, the broth is made by allowing bones a long slow cooking time to fully extract the nutrients and minerals from them. Once you know how to make chicken broth, you will find that it is, like most things, more tasty, healthy and economical if it is homemade. 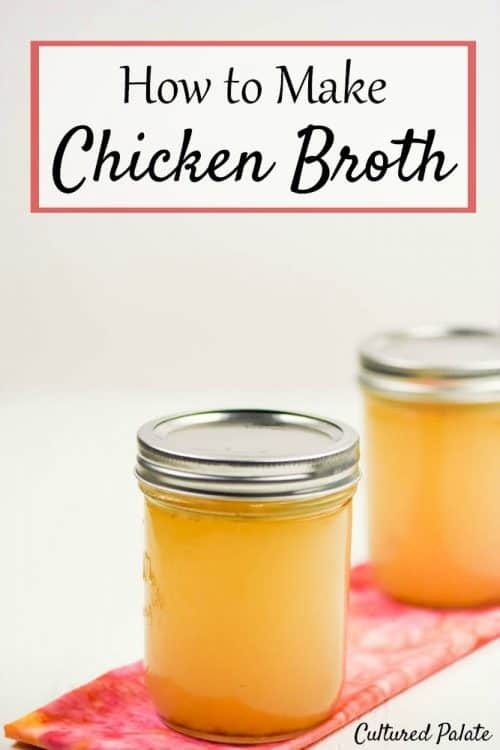 Watch the “How to Make Chicken Broth” video to see exactly how I make it and just how easy it is to do! I love knowing what other people use and why they like particular products. So, here are items you see me use in the video and why I like them. Most of the links will take you to Amazon. A Crock Pot makes like so much simpler and I switched back to this manual dial one since my last digital one did not last very long. I also absolutely love my Instant Pot and have heard that it is a great for chicken broth. Raw apple cider vinegar is essential to making bone broth since it acidifies the water and helps extract minerals from the bones. I like both Bragg’s and Napa Valley Naturals. I love these 1/2 gallon wide mouth jars and use them to store my broth in along with many other things in my kitchen. These plastic wide mouth lids are wonderful to use with the mason jars and they don’t rust. Pyrex glass bowls work for so many different tasks in the kitchen. They are great for mixing and since they come with lids, they are also great for storing leftovers. Polish Pottery – I purchased most of my Polish Pottery when we lived in Switzerland. Now, to replace pieces or buy new ones, I shop eBay. Why is bone broth so good for you? There have been recent news articles on major networks about the benefits of bone broth – and, this can be chicken broth or beef bone broth. Here are just a few of the benefits that I hope will convince you to learn how to make chicken broth. To read all of them, head to 15 Health Benefits of Bone Broth. Turns out, chicken soup (or any other bone broth based soup) is good for more than just your soul! In fact, more and more is published about the health benefits of bone broths – like this article published in the New York Times! I first discovered the benefits of bone broth while on the GAPS diet. 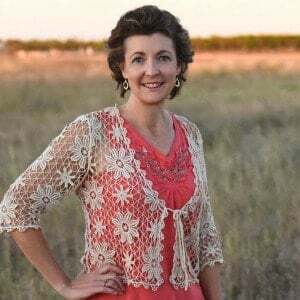 In the first stage of the introduction diet, it is one of the first foods eaten and continues to be consumed throughout the diet. To use Dr. Campbell-McBride’s words from the Gut and Psychology Syndrome book, bone broth is excellent for “healing and sealing” your gut. Bone broth contains many nutrients and because it is easy to digest, your body readily uses those nutrients. Gelatin is one of those nutrients. You probably already know that gelatin supports your connective tissue and makes fingernails grow. But, it also plays an important role in digestive health. The gelatin found in bone broth is a hydrophilic colloid – it attracts and holds liquids, including digestive juices. It also protects and soothes the digestive tract (the mucosal lining, to be specific) and aids in its healing. Bone broth contains glucosamine and chondroiton. These help with arthritis and joint pain (though the science is still being verified). You don’t have to buy expensive supplements, just add bone broth to your diet! Bone broth is gelatin which is a protein and since it is so economical to make, it is an inexpensive source of protein. Bone broth contains minerals in a form that is easily accessible for your body’s use – these include calcium, phosphorus, magnesium and trace minerals. Bone broth is a good source of the amino acids arginine, glycine and proline. Glycine supports the body’s detoxification, supports digestion and the secretion of gastric juices. Glycine also promotes a healthy immune system, digestive tract, and central nervous systems. One of the goals by many who are familiar with traditional preparation and cooking techniques is to have a bone broth that gels once it cools – this indicates that the broth is high in gelatin. The secret of a rich bone broth is a long and slow cooking time. Another factor in having broth that gels is the quality of the ingredients used. 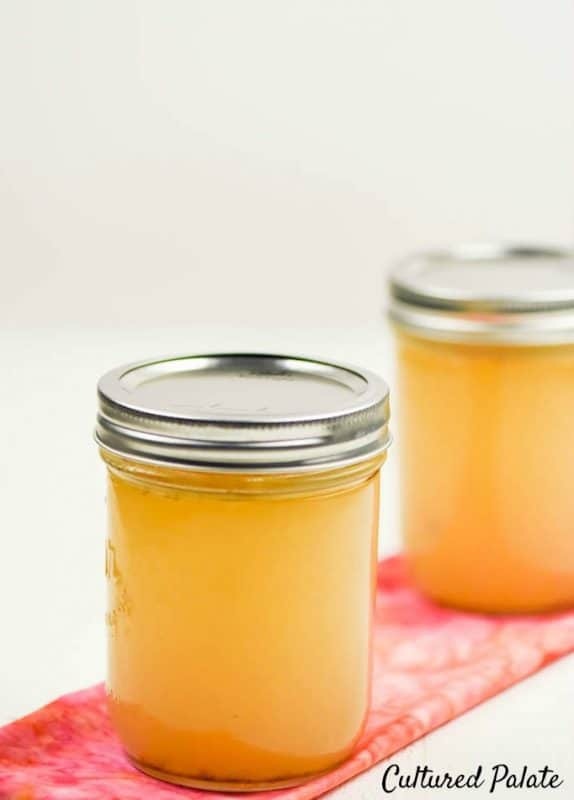 For chicken bone broth, use pastured animals, fresh or frozen for the thickest gel. Sometimes, even when cooked long and slow, conventionally raised chickens just will not make a broth that gels – it is still full of minerals and nutrients but just lacks the necessary amount of gelatin required for gelling. Some people recommend using chicken feet in addition to the carcass for chicken bone broth – the feet, which are a great source of gelatin, are peeled and thrown into the pot. Although I know they contain large amounts of gelatin, personally, I just cannot bring myself to do it! If you have ever seen chickens shuffling through your family milk cow’s cow-pies to get every last morsel of grain left in it, well, let’s just say, my family would die if they saw chicken feet in the stockpot! So, how do you make chicken broth, chicken bone broth or chicken stock – whatever name you prefer? First, I start with a whole chicken and place it in the crock pot (photo 1), cover it with water and cook it on high for 4 hours (overnight) on high. In the morning, the crock pot has turned to warm and I remove the chicken from the water (photo 2). Next, I separate the meat from the bones (photo 3). I have reused bones when the first batch of broth gels very well – as long as the resulting broth will gel as it cools, you can reuse the bones for a rich broth. The above method can also be done in a heavy stock pot on the stove – bring the bones and water to a boil, reduce the heat to simmer and cook for 24 hours. This is one of the easiest ways to have a continuous supply of bone broth – add water as needed along with more bones, vinegar, vegetables and keep it going! Because this is my favorite way to make chicken bone broth, this is the way I demonstrate in the video! I start with a frozen whole chicken and place it in the crock pot (or stock pot if you prefer). You can see more details in the printable recipe below. Probably one of the most economical ways to make chicken broth is to buy chicken parts like the legs or thighs when they are on sale. These can be put right into your crock pot or stock pot and continue with the recipe below. Another way to make Chicken Bone Broth is to use a rotisserie chicken. Separate the meat from the bones. 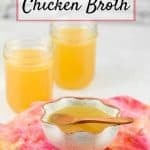 Use the bones for the following chicken bone broth recipes. Known for its nutritional punch, homemade chicken broth is an excellent base for any soup. 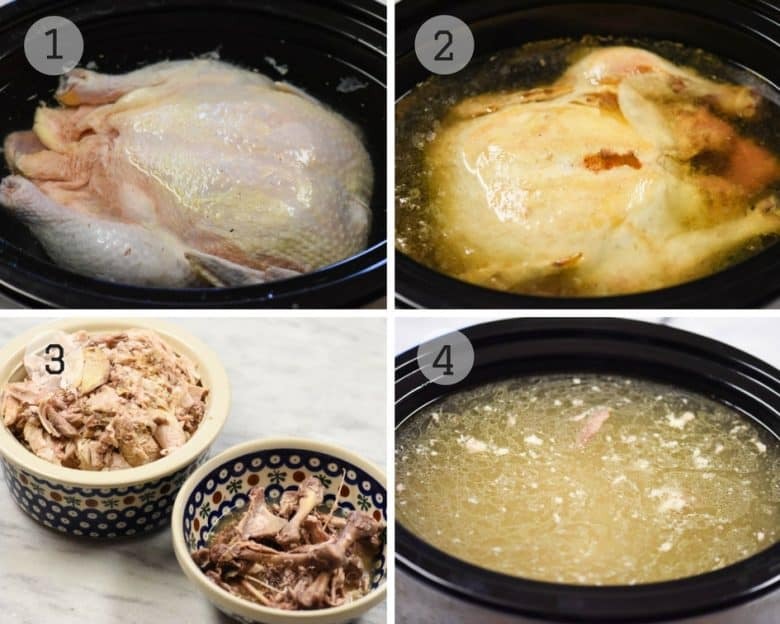 If using raw chicken - cover the chicken with water in either a crock pot or stock pot. Cook until tender (4 hours on high in the crock pot), remove from water, separate the meat from the bones. If using a roasted chicken - separate the chicken meat from the bones. Place the chicken bones in a crock pot or stock pot and cover with water. If the chicken was cooked in the crock pot covered with water, place the bones back into this water/broth. Add vegetables (if using) and vinegar. For crockpot - turn crock pot to high until it boils and turn to low - cook for 24 hours. For stock pot - Bring to a boil and reduce the heat to simmer. Strain the broth and allow it to cool. Chicken bone broth will keep refrigerated for at least 1 week or in the freezer for months. One of the goals by many who are familiar with traditional preparation and cooking techniques is to have a bone broth that gels once it cools - this indicates that the broth is high in gelatin. Sometimes, even when cooked long and slow, conventionally raised chickens just will not make a broth that gels - it is still full of minerals and nutrients but just lacks the necessary amount of gelatin required for gelling. Thanks for the tip, Cris! I loved all the helpful information you gave and the video is great. Thanks so much for sharing, I’m saving this recipe to try asap! So glad it helped, Emily – thanks for taking the time to comment! Am 86 yrs old. Younger part of my life was living on a ranch. My father loved chicken feet. He would take a sharp knife and scrape the skin off the feet. Of course he would wash them first then scrape then throw them in the pot with the rest of the chicken. I learned to eat almost every part of the chicken. Yes I am making high protein chicken broth. Is it possible (and would the broth still be as beneficial) to add only the bones and apple cinder vinegar (less the vegetables) at step 4 on your instructions, drain out the bones after 24 hours, THEN add the vegetables, cook for a further period of time to soften the vegetables in the ‘stock’, add the chicken meat back in and consume it as a soup? Kelly, that would work fine. Most of the time, I do not add vegetables anyway because I plan to use the broth for another recipe like chicken enchiladas. Hi Dina-Marie, can I ask about the gelatin, when I roast a chicken and you have all that lovely juice in the bottom of the tray at the end of cooking, I usually let it go cold and scrape the white fat off the top, I’m left with jelly and I add this to my gravey for taste, is this the healthy gelatine? ?